Refuse to inherit dysfunction. Choose your own path. Every family has it’s issues and some forms of dysfunction. In fact, most adults will tend to blame their current problems/behaviors on something their parents did or did not do. So many people are holding on to the belief that their life has been sabotaged or already defined by those years at home. This is a problem because blaming will keep you stuck and a victim for…ever if you let it. I want to share a few things to think about today to help you break this cycle and how to move forward – even if it’s just a baby step – it’s still forward. First, acknowledge the past. Give yourself room to validate yourself and NAME what the problem is. I want you to know that I do hear you. Yes, your family was dysfunctional. They did do crazy things and yes, it has contributed to who you are. Every family has their own version of crazy. It doesn’t make it right. I’m not saying this to downplay your past in any way. It was real. It did happen. It absolutely left you with scars. But I don’t want you to get stuck here. Don’t blame your family, your parents, your siblings even though in the moment (s) it feels good to do so. But doing that, taking that course of action isn’t getting you anywhere. It’s keeping you stuck in victim mode and the biggest problem with that is you’ve given them power over you. Doing this you tell yourself that you can’t change and be who you want to be UNTIL they change…and they probably aren’t going to change…so don’t give them your power. They’re not going to treat it how you want them to. They get to behave and act how they want to and YOU get to choose what YOU are going to do, think, say, and feel. I’m not telling you to turn a blind eye to the past by any means or to pass off their behavior as okay. I’m telling you to name why it’s specifically a problem for you NOW and be willing to accept that you, as an adult, have the power and responsibility to choose what YOU are going to do now. Acknowledge that it happened. Accept that THEY are human. They made choices. They did things that left an impact on you…but they are not to blame. You are a strong human being. You have gifts, talents, and creative ways that you can use to see or use these past experiences as a help to you and they can become a stepping stone to a stronger you. Acceptance is shifting your energy from blaming, staying in victim hood (which consumes A LOT of energy) and negativity to finding a neutral space. 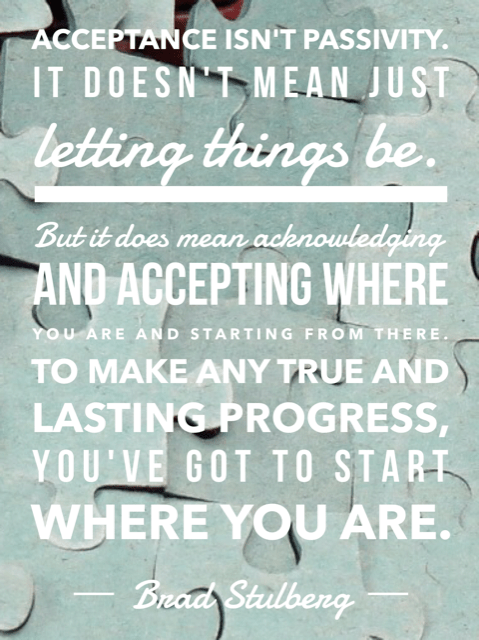 Acceptance isn’t going from misery to happiness, it’s just about finding a starting space. A fork in the road where you choose to stop taking the blaming path and pivot instead to moving forward in the direction that will help you be a better you. Third step: What do you want? What choices do you have? Most of us know really clearly what we DON’T want. We don’t want to have the relationship we have now. But what is it you DO want? How do you want to feel when you think of your parents? Your family? Your siblings? Your in laws? 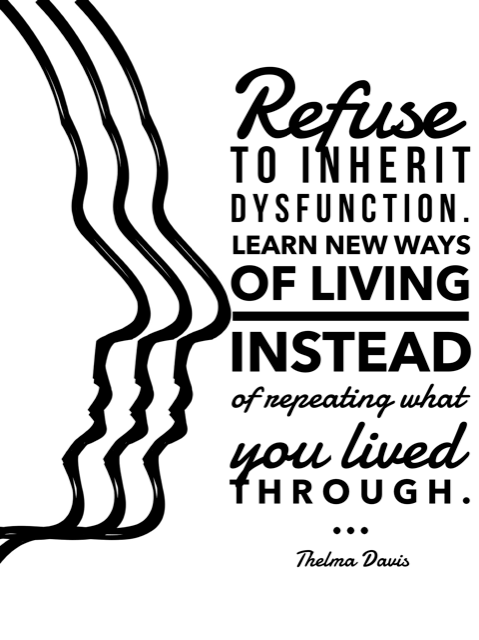 “I refuse to inherit the dysfunction of my former years. Use these things to help you on your journey to being authentically you, the person YOU DECIDE you want to be. You are NOT your past. You are NOT your parents, your siblings, your family. You are an individual who can learn to find and use your gifts to compliment your family. You’re really smart. You know what to do. You know what is serving you and helping you to be your best you and you also know what isn’t serving you and what is keeping you back from showing up as you’re best you. Listen to yourself. Accept that they happened FOR you and not TO you. Accept that you have the power and capacity to change. Then decide what direction you’re going to go – to not inherit dysfunction. Okay, keep me posted! I’d love to hear more from you and your process! 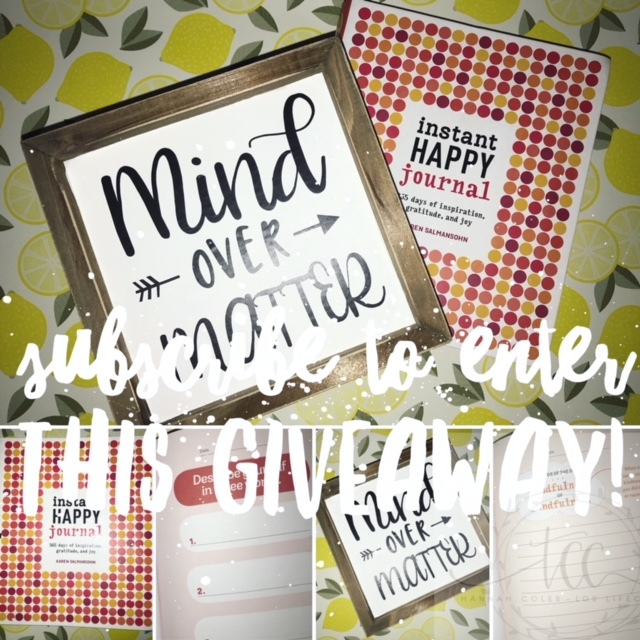 And…don’t forget about my GIVEAWAY! Last, TAG me so I can count that you did it!